The book of Acts tells Gentile converts how their new religion got started. Here the author depicts an early challenge to Jews to embrace Jesus as the fulfillment of their hopes. The community of John had dissident members who preached a weak doctrine of Jesus, who claimed a special knowledge of God, and who did not practice Jesus' commandment to love one another. This letter tries to heal the wounds caused by these members in the community. The same author who gave us the book of acts gives us this gospel. He depicts Jesus reassuring doubtful disciples, and connecting their heritage to the startling events of their present. Saint Luke wrote for an audience quite different from those of Mark and Matthew, different, too, from the Thessalonians and many other recipients of Paul's letters. Luke's readers lived a generation or more later than the apostles, after the destruction of Jerusalem by the Romans in 70 C.E., and outside the Holy Land. They had never been Jews. They were cosmopolitan, middle-class and Gentile, living in a skeptical society, yet attracted to a religion with long historic Jewish roots. But that new religion only came to its fulfillment by reaching out to all humankind. To tell that story, to ground his audience in their adopted religious heritage, and to keep them focused on the religion's mission, Luke needed to tell the story of Jesus anew in this gospel, and needed a second book, the Acts of the Apostles. There's a lot here about the Jewish heritage of your new religion: "The God of Abraham, the God of Isaac, the God of Jacob ..." and "[God] had announced beforehand that his Christ [the Greek word for the Hebrew word Messiah] would suffer." A Christian could expect to hear a lot about such things, just as a regular reader of these Notes still does. The strong accusations on Peter's lips, and his all-or-nothing demands, hint at the source of Christianity's rupture with the Jews. That break led the first Jewish Christians to reach out to Gentiles, and to begin to see the universality of God's design. This explains the religion's very openness to the first-century reader of Acts, and sets the agenda for the role of this church in the world. Proclaiming It: The first sentence is long. Its principal verb is right in the center, "glorified." So read it slowly and emphasize the expression "glorified his servant Jesus." Then you have a chance to emphasize a main theme of Acts in the phrase "God raised him from the dead; of this we are witnesses." An Oratorical Suggestion: Many lectors I've heard give me the impression they're trying to be modest and self-effacing, wanting the congregation to notice not the speaker but the speech. That worthy goal seems reasonable, not letting the messenger get in the way of the message. Many lectors seem to want to convey this by refraining from sounding theatrical. They forget that the acoustics of their churches work to dampen further any expressiveness that might linger in their voices. Were we all pure spirits, that would work perfectly. If we were monks or scholars studying scripture in libraries, with dispassionate scientific objectivity, we'd all get the message clearly without help from a fellow creature. But that's not the way it works in a sacramental religion. As inefficient as it is, God has chosen human flesh and human means of communication to get the saving truth to us. We're saved not by ideas but by events, events that were startling and unpredictable. Such events can only be communicated as stories, and stories told in a bloodless way have no impact. The messenger's excitement about the message is essential to the communication. You don't "catch" faith from books, even from inspired books. You catch it from already faithful people, and not from the ones who hide their lights under a basket. 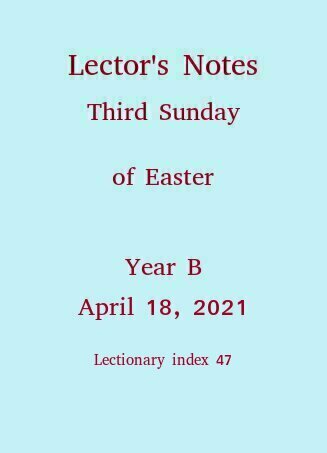 Now you're a lector serving a congregation of human beings who want to grow in faith. For a few minutes this Sunday, God wants to use your voice, your spirit and your flesh, to tell a story of saving events. Well, tell this story like Peter told it. Peter, whom the gospels do not hesitate to describe as impetuous, argumentative and fearful to the point that he denied even knowing Jesus, is bellowing out this speech to explain how he just cured a cripple. He's full of passion for Jesus and the spread of the gospel. Don't hesitate to try to sound like him. Take the lead among lectors in your parish. Try it, reflect on the outcome, and, if you wish, share the results here. Now let's look at the reading verse by verse. My children, I am writing this to you so that you may not commit sin. But if anyone does sin, we have an Advocate with the Father, Jesus Christ the righteous one. Since holding false doctrine leads to sin (the sin of dividing the community, if nothing else), the author wants to protect his readers from both. In the event of sin, though, relief comes through the advocacy of Jesus. This refutes the heretics' notions numbered 12 and 13, above. He is expiation for our sins, and not for our sins only but for those of the whole world. This verse, too, addresses points 12 and 13. The way we may be sure that we know him is to keep his commandments. Cf. points 9 and 10, above. A variety of ancient religions claimed to reveal knowledge (in Greek "gnosis," pronounced with a silent g like the silent k in our word "knowledge.") of God that was otherwise hidden from the unknowing. Adherents of these sects were called Gnostics, and the movement in general, Gnosticism. Christianity, in contrast, was always public, and nothing is more public than God's commandments. Also public knowledge, for the most part, is whether or not one keeps the commandments. In any case, with this verse the author is saying you don't need Gnostic secrets in order to be sure that you know God. What you need is readily available. Whoever says, "I know him," but does not keep his commandments is a liar, and the truth is not in him. This reiterates the author's condemnation of the heretics on the previous point. [verse 5a] But whoever keeps his word, the love of God is truly perfected in him. Verse 5a again emphasizes the importance of keeping the commandments. The Catholic lectionary selection, at least in the United States, ends at this verse. [verse 5b] This is the way we may know that we are in union with him: [verse 6] whoever claims to abide in him ought to live (just) as he lived. Verses 5b and 6 go on to invoke the example of Jesus' earthly life as the standard for knowing God/keeping God's commands. Proclaiming It: From the above, you know the argument the author is making and how each verse contributes to it. While argumentative, the author also paternal, and that side outweighs the lawyerly. So emphasize the concerned, gentle, paternal side. I'd read this in the voice of a loving elder who is worried that people he loves might get into trouble. He wants to scold only gently, if at all, and assure them that it's quite possible to stay on the right path. Duccio, di Buoninsegna, d. 1319. 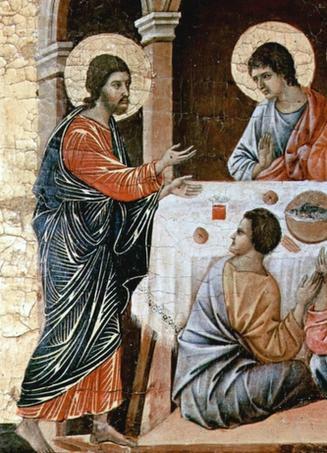 Christ Appears to the Disciples at the Table after the Resurrection (detail), from Art in the Christian Tradition, a project of the Vanderbilt Divinity Library, Nashville, TN. http://diglib.library.vanderbilt.edu/act-imagelink.pl?RC=49184 [retrieved February 3, 2018]. Original source: www.yorckproject.de.